Since “WAITRESS” opened at the Fabulous Fox, I’ve been craving pie. Small wonder, as this is one yummy, funny, warm show, full of heart and, well, pie. The hit Broadway musical, based on Adrienne Shelly’s film of the same name, runs through April 7. 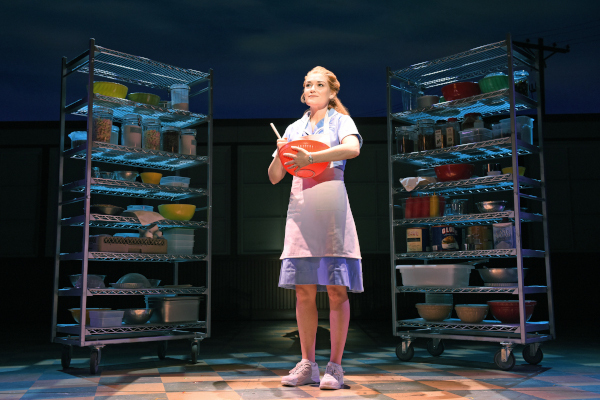 The musical, like the film, really should be called “Pie Maker,” because that is waitress Jenna’s (Christine Dwyer) primary job at Joe’s Pie Diner, where she works. It is also her major talent and a form of self expression for a young woman dreaming of escaping her small town, and especially her marriage to selfish, abusive Earl (Matt DeAngelis). That premise sounds a bit grim but in fact, WAITRESS is full of humor, hope and possibilities, as well as some terrific songs. And then there are the pies, which Jenna makes and describes throughout the show – pastry dreams that express her feelings and make our mouths water. Those who saw the movie will recognize the story, as the musical version follows the film’s plot closely. So they are not surprised when, in the play’s first scene, Jenna discovers she is pregnant. She fearing she’ll never be free of Earl now, her spirits are shored up by her co-workers Dawn (Ephie Aardema) and Becky (Maisha McQueen) . But Jenna’s life takes an unexpected turn after she meets her new OB/GYN, Dr. Pomatter (Steven Good). In fact, life holds surprises and new possibilities for everyone at the pie shop. The cast is part of what makes this such a delightful show. Dwyer is marvelous but she gets great support from the rest of cast, each spot on in their roles. There is as much comedy as romance in WAITRESS, and it touches on thought-provoking universal topics any woman can identify with. Joe only wants Jenna to wait on him when he stops by his pie shop, and he is very picky about his orders. But she charms him as she does everyone else – and besides he loves her pies. Crabby restaurant manager/cook Cal (Ryan G. Dunkin) and Becky fight like cats and dogs, while shy Dawn always seems out of step. Yet together they are more than a team, they are family. The major roles in the cast are rounded out with Richard Kline as crusty but sweet old Joe (Richard Kline), who owns the shop as well as several other businesses in town. Jeremy Morse is the comedy stand-out in the role of Ogie, who meets Dawn through on online dating site. Local cuties Penelope Garcia and Norah Morley share the role of little girl Lulu in the second half of the play. The musical adds songs by 6-time Grammy nominee Sara Bareilles, whose works include “Brave” and “Love Song.” Unlike some films turned into musicals, Bareilles’ songs are really a plus, catchy tunes that lean towards blues, Motown and pop music forms more that other musicals. It is also worth noting that this is an all-woman production, with book by Jessie Nelson (I Am Sam), choreography by Lorin Latarro (Les Dangereuse Liaisons, Waiting For Godot) and direction by Tony Award winner Diane Paulus (Hair, Pippin, Finding Neverland). The catchy tunes are matched by nice choreography, often built around pie-making. A showstopper is a comic number featuring Becky’s oddball suitor Ogie “Never Ever Getting Rid Of Me,” with some really impressive and belly-laugh inducing eccentric dancing. WAITRESS is a complete treat, a fast and entertaining kind of Everyman (or woman) fantasy that has a lot more fun and heart than the ordinary romantic comedy – just as Jenna’s pies are way beyond ordinary. Movies are not just for teens - adults love movies too! But it can be hard to decide which movies offer something for more grown-up tastes. Marquee Reviews and Marquee By Marquis is here to help, with film reviews geared to help you decide what is worth your time and money. Marquee Reviews also offers theater, dance and performing arts reviews of productions on St. Louis stages, plus the must-sees at film festivals throughout the year. Arts and entertainment reviews for the thinking audience!